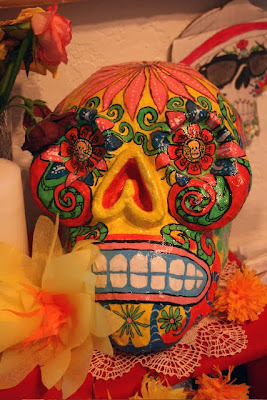 Dia de los Muertos, or Day of the Dead, dates back to pre-Colombian days of ancient Mexico. 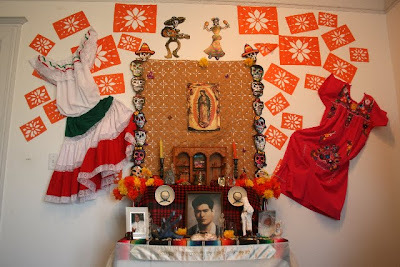 On Nov. 1 and 2, many Mexicans honor their ancestors who have died by bringing food and flowers to the cemeteries, building altars in their houses, eating special bread called "Pan de Muertos" and decorating their houses with skeletons and skulls. 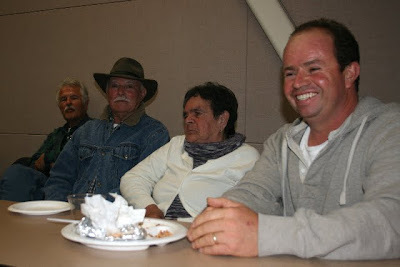 Last Friday I went to Watsonville, a Mexican community just 15 miles south of Santa Cruz. 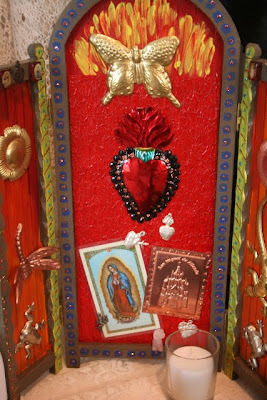 First stop, the Pajaro Valley Arts Council gallery to admire the various altars. 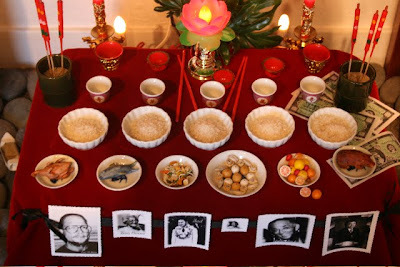 I've included several photos below. 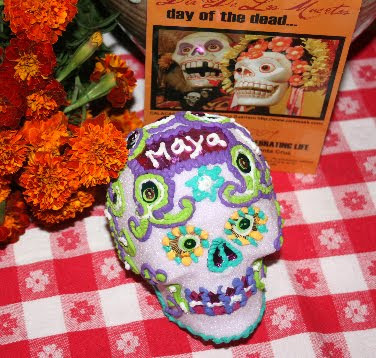 I also bought a sugar skull, or "Calaverita," in memory of Maya (above) and traditional marigold flowers for my Day of the Dead altar at home. 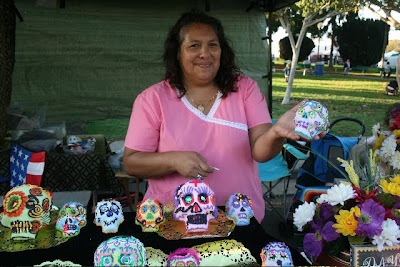 Here's Marta Gonzalez (831-707-7811) who sells sugar skulls at the Watsonville Farmer's Market at this time of year. 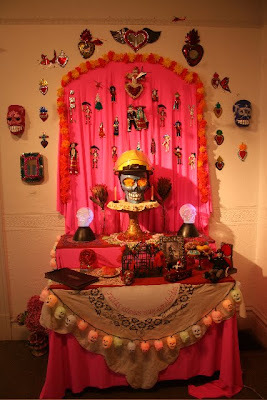 This altar had cool plasma skull lights. 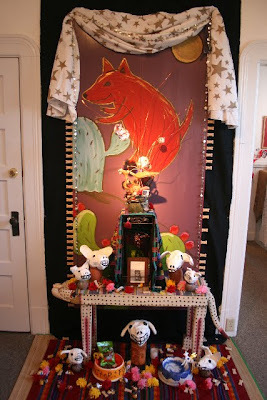 This altar was in memory of all the things their dog had destroyed. 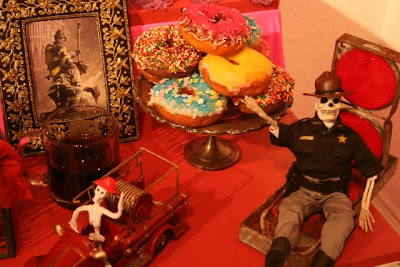 This playful one features dancing skeletons a la Jose Guadalupe Posada. 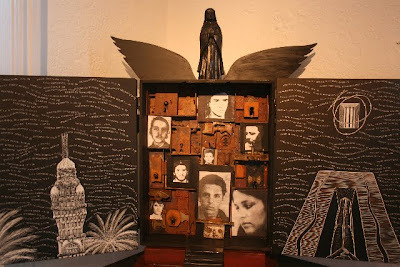 That same evening, I was fortunate to see the documentary "Bracero Stories" (check out the video excerpt from the movie), sponsored by the Women's International League for Peace and Freedom. After the film, many family members of braceros, or guest farm workers, stood up and shared their stories. I showed some enlargements of Daniel's dad when he was picking watermelons in Bowie, Arizona through the Bracero Program in 1958. A big treat was when a gentleman in the back row spoke about his own experiences. He's 78 years old and entered the US in 1948 at the age of 17, so he had to lie about his age to qualify for the program. He and most of the other braceros thought they were being drafted to fight in WWII. His girlfriend, who later became his wife and is seated beside him in this photo, was afraid she would never see him again. But instead he worked the fields all over the U.S. The 10% that was taken out of his paychecks and sent to a Mexican bank for retirement disappeared. The Mexican government has promised to give $3500 to anyone who can prove they were a bracero, but so far I haven't heard of anyone who has succeeded in getting compensated this pittance of what they're owed.